I’m so excited! I’m getting a dress form for my birthday! Her name is Leticia and she’s a Singer. She’s arriving next week, but here’s a picture so you can get excited too! My knitting guild, The Windy City Knitting Guild, volunteered at the Museum of Modern Ice festival in February, 2008. We put together a giant craft studio, with knitting and other handicrafts. Some of the many things they had available were pipe cleaners, beads, and little satiny balls that look like tree ornaments. I got to thinking. 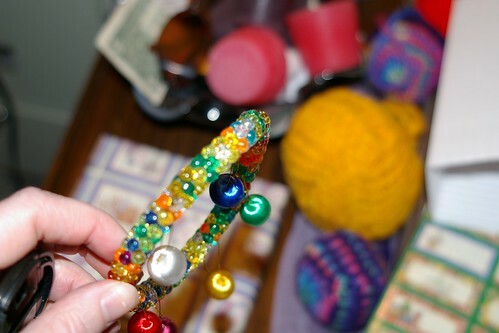 When I was little, we used those little triangle beads to make wreath-shaped ornaments… what if…? Figure 1: Okay, it looks goofy. But it’s the only one of its kind in the world, so be nice to it. It’s lonely. Figure 2: Side detail of lonely ornament of doom. 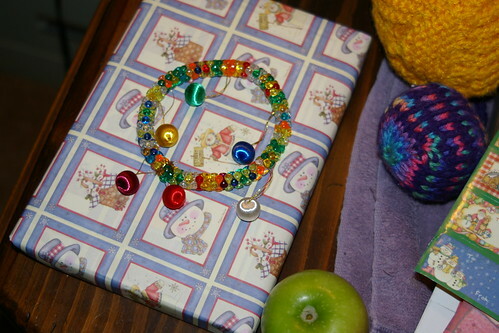 The beads came out kind of blury, but the little satiny ornament thingies are clear. I mean, don’t they remind you of ornaments? This is from Handknit Holidays, by Melanie Falick – which if you don’t have it, is an excellent book. They’re really easy to do, actually. Easy practice for circular knitting. Figure 1: This was the first one I made. I stuffed it with yarn bits. I need to buy some batting! (Because I can’t finish the rest of the balls I’ve made, but don’t tell anyone…) This is made with some cool overdyed yarn that we had for a community project last year (2007), with some navy acryllic that I had gotten at a garage sale (it’s really awful and scratchy, but you can’t tell on the ball). 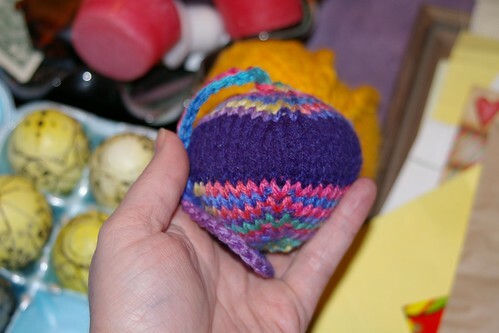 Figure 2: This is another ball using the same yarn but a different pattern. I call it Windowpane, but I don’t know if it has another name. It’s a slip stitch pattern using two colors, a MC (navy) and CC (the overdye). Knitting in stockinette, 2 rows MC, 2 rows CC – but with the CC, knit 1, then slip 1, etc. (If you’re knitting flat, then on the row back you’d purl and slip.) Carry the color not in use up the side of the knitting. 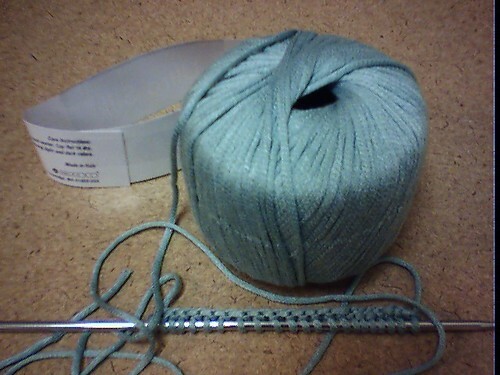 If knitting in the round, it helps to have a stitch marker to show the beginning of the round. Figure 3: This is done with some of the acryllic I got at that garage sale. It’s really awful stuff, perfect for ornaments. 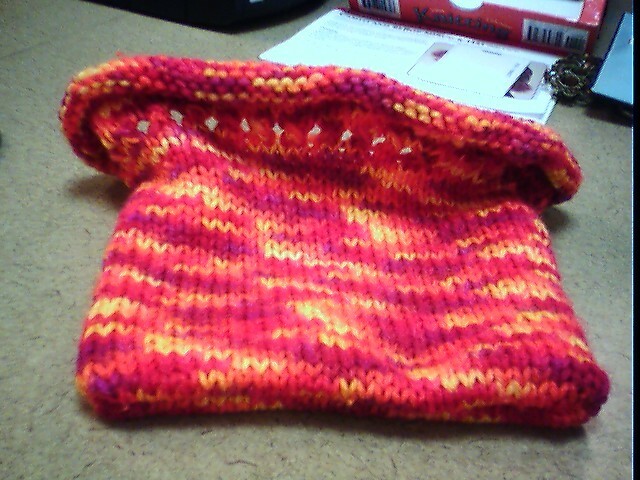 It’s got a stitch pattern that didn’t work out very well, I tried to do some striping and such. 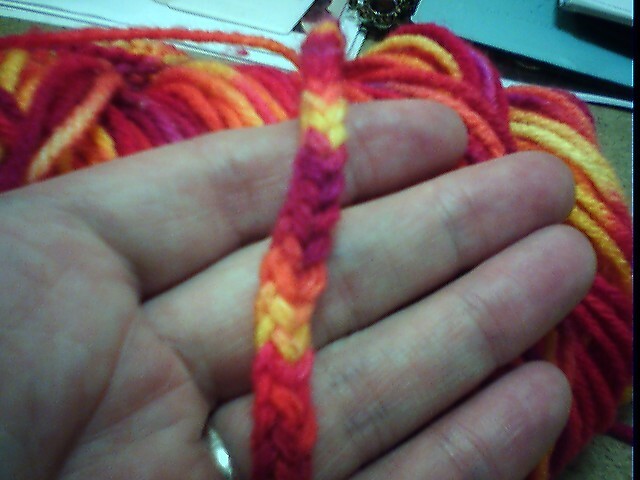 The loops are crocheted chain stitch; but you could just as easily to a 2 stitch i-cord. 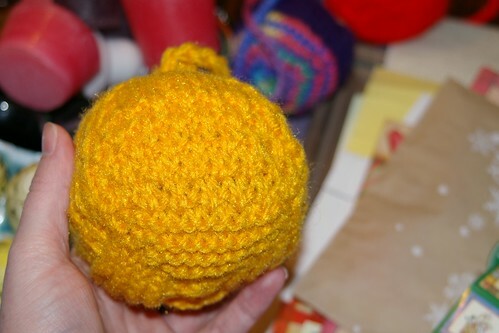 Figure 4: And the piece de resistance: do NOT use ugly goldenrod acryllic on the large ball. You can’t really tell it very well here, but I tried to use my hand to show perspective – this is the 5 inch ball. It’s horribly ugly. I did more patterning with it, using garter rows on the bottom and seed stitch in the center. It was cute, though. When I finished it, I was on the train. I looked up at one point and realized I had an audience. (The train was packed for evening commute.) So I set it on my lap and stuffed it. The looks on the faces around me when they realized what it was made me laugh. Never underestimate the power of handicrafts to break the ice. NOBODY on the train in Chicago talks to each other, it’s just “not done.” But I had five or six people all interacting with me over this horrible, ugly, scratchy ball. 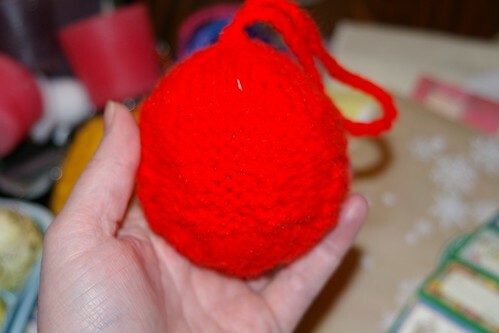 It’s kind of growing on me; my ugly duckling ball of doom. Figure 4: This is from Ukrainian Design Book 2, Egg 14. This is after the first dye bath, yellow. As you can see, the color is not very brilliant, which means I need to remix it. Figure 5: Another view of the egg. The eggs are very wet after the dye bath. We use paper towels to blot the eggs and then let them air dry before adding more wax. 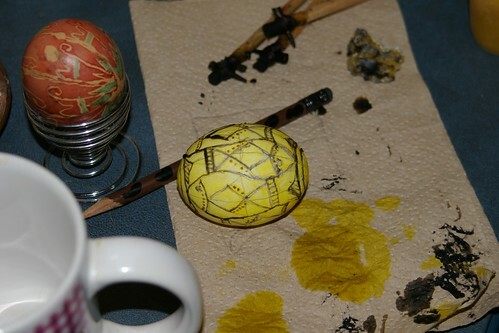 Figure 6: Another view of the egg with wax covering the first section of design. The red egg on the left is a finished egg. 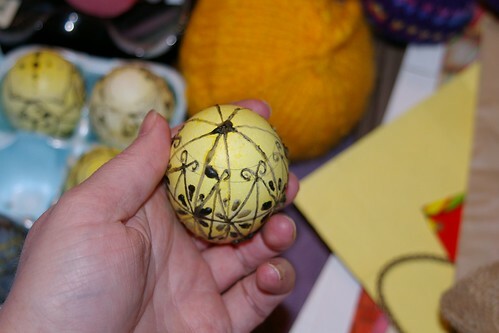 Three kistki are behind the yellow egg along with the beeswax. Figure 8: Side view of egg. The yellow part is beeswax, as is the black. The blackened was is from the carbon from being melted. If you use an electric kistka, shaded wax is available since it won’t have the carbon. Figure 9: This is Egg 2, Design Book 1. The design calls for purple, which I didn’t have made up, so I used Scarlet in the prior dye bath and then Royal Blue. 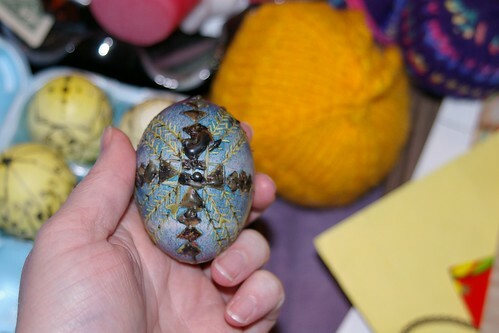 When I took the egg out, it didn’t really blend with the Scarlet and now has dots of color, both Scarlet and Blue. Figure 10: Side view of egg. 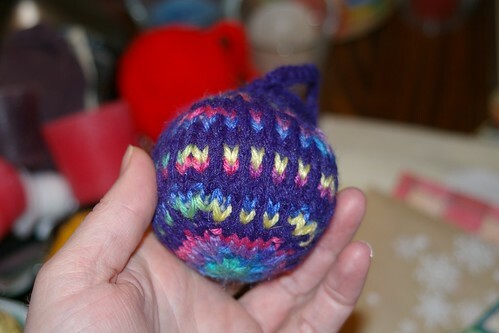 The knitted balls in the background are for decorating a tree. Figure 11: Design Book 1, Egg 3. This is the first dye bath, yellow, but as you can see from the picture the dye is very pale. I have a Gold dye as well that I may experiment with instead of the yellow. Figure 12: Top view of egg. This is just the first dye bath. I’ll add more at the next time we decorate. 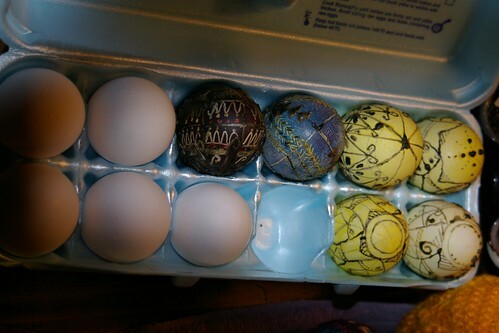 Figure 13: This is all of the eggs we decorated. 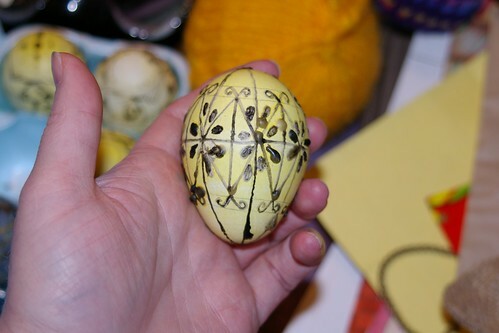 Of the four yellow eggs, three of them are the Design 14 that we did together. The black, blue, and yellow are the ones from Design Book 1. 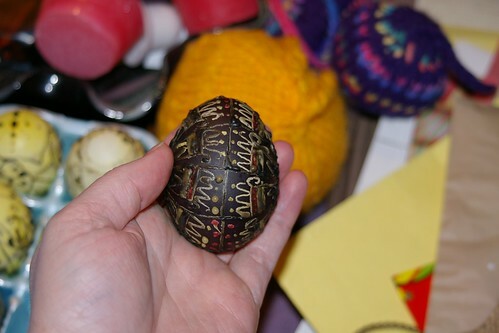 This was the first Pysanky Day we’ve done for this year. We’ve got another one scheduled on April 14th since we didn’t finish. 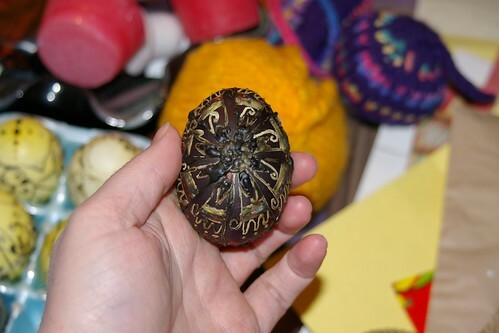 Pysanky are traditional Ukrainian decorated eggs, a craft that has a 4,000 year history. I enjoy them because it’s a chance to play with something three-dimensional but using two-dimensional techniques – drawing and writing. Essentially, you start the design on a clean egg in pencil. 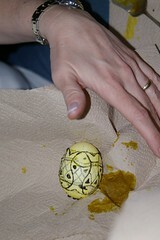 Then using a stylus called a kistka, melted wax is applied onto the egg. Successive dye baths add color, and using the wax-resist process, the design accumulates. 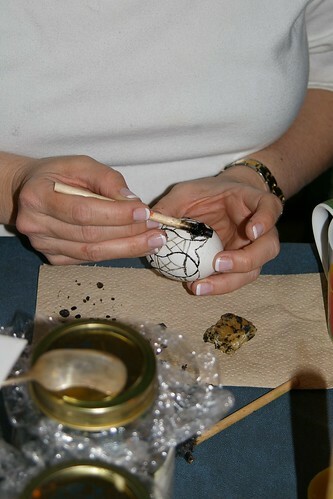 When finished, the egg is covered in wax which is melted to reveal the design. 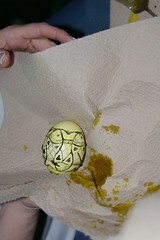 Many artists then cover the egg with a polish to bring up the colors. 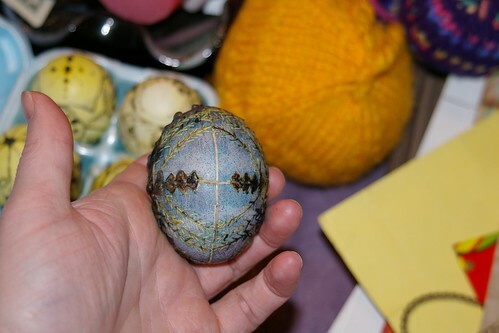 One of the cool things about this is that you start with a raw (uncooked) egg and just paint it. You don’t have to blow out the innards, though some artists do. I don’t, because it gives me a headache. 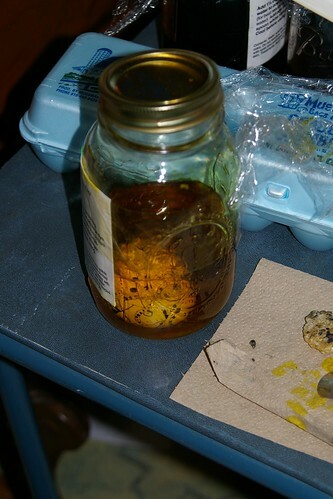 After a few months, the egg will naturally dry out – no other preparation is required. Figure 1: Applying wax to raw egg. You can see the outline from the pencil under the stylus. 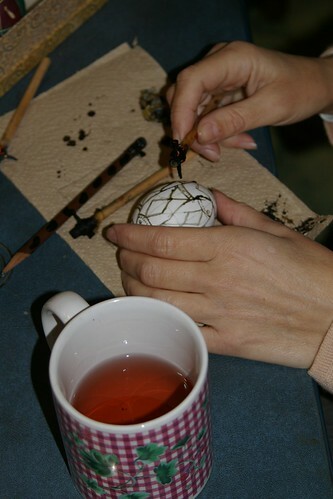 The stylus is filled with wax and melted using a candle, then the melted wax is applied to the egg. It’s a little tricky to keep the stylus from dripping; I’ve found that if you only heat the tip then it melts more slowly and doesn’t goop. Figure 2: Second view of wax application. On the paper towel in front of the artist, you can see the yellow and black cake of beeswax used. Figure 3: First dye bath, in this case yellow. Eggs are left in the dye for ten to fifteen minutes. Dyes can be preserved from year to year, and remade when they don’t dye as brilliantly. My yellow was made three or four years ago and only now needs to be replaced. Okay, this is a showcase for the man of the house. 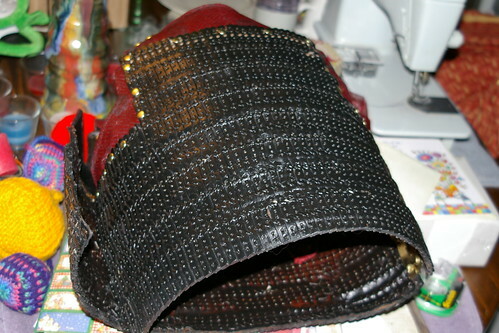 Michael is making himself Samurai armor from six cow hides we bought last summer. 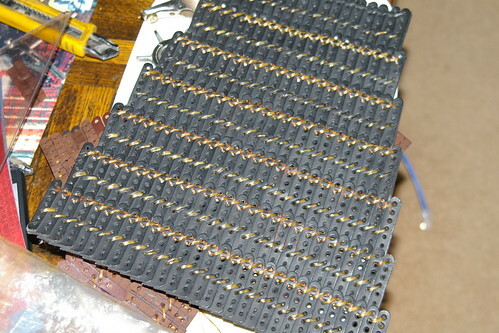 He’s cutting them into 2 inch by 1/2 inch segments, punching eight holes in each segment, and then sewing them by hand. Then he laquers it. Then he laces it. 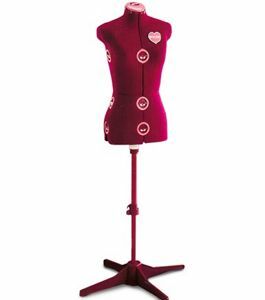 Figure 1: This is the torso piece. The red area is a beautiful Asian-patterned upholstery fabric we found at Hancock Fabrics. It is cut to fit, sewn to the leather and then glued; then lacquered. Figure 3: Detail, skirting piece with lacing. I was naughty and found two yarns last week that I bought on impulse (meaning, with no specific project in mind). The irony is that I think I may make something with them both together. Berocco Ultra Silk is 20% Silk (Soie), 40% Rayon (Viscose), and 40% Nylon (Polyamide). It is soft and springy and reminds me a lot of jersey fabric. 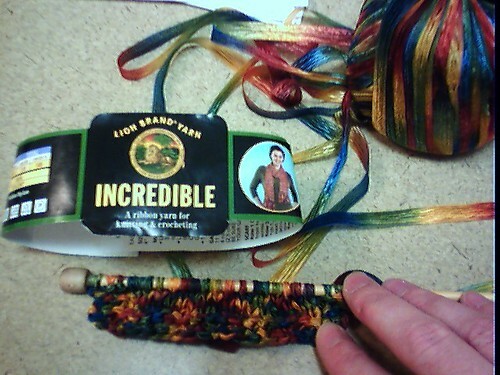 Lion Brand Incredible is 100% nylon, but has a crunchiness reminiscent of silk. It calls for size 15 US needles, but I did my swatch with 7 US (4.5mm). I’m thinking a shrug or vest would look nice, with the Incredible as a border and the Ultra Silk as panels down the center, maybe with a textural pattern like vines and leaves. I’m just in the swatching stage right now, so we’ll have to see. I started this project for Eden with the intent of making coasters. Just a modest set of four coasters. This expanded into a carryall pouch for the coasters, based on a pattern from Last-Minute Knitted Gifts by Joelle Hoverson – the cover pattern, as a matter of fact. The bag knit up very quickly, only taking about four hours on the train. Knit in the round starting with 90 stitches, knit for about 3 inches and then do an eyelet row. 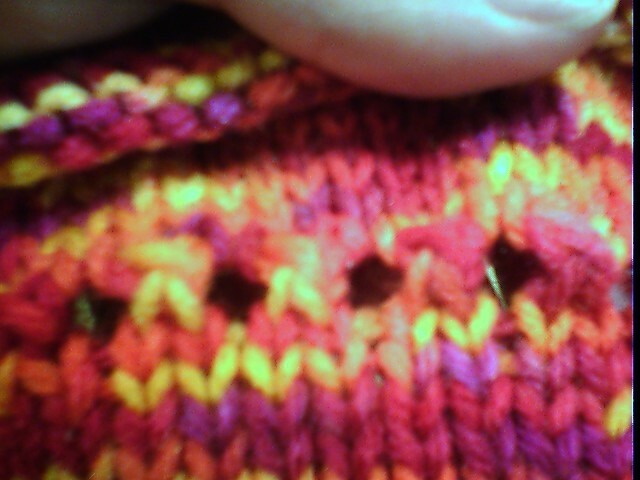 The eyelet row came out very nicely; I like the way the stitches architecturally arch from one to the next. YO, slip 1, K2tog, psso, all the way around. This leaves 60 stitches. Knit in the round for about 6 inches and a three-needle bind-off means no sewing at the bottom! The two-stitch i-cord was actually difficult because it’s hard to keep the stitches neat, but it is coming out in a cubicle tube. Very cool. Image I: The bag itself. The colors are from a Worsted-Weight (double DK in the U.K.) acryllic, washable in warm and dryable (although it may fuzz, so to avoid that, just lay flat to dry). The colorway was chosen for a volunteer event to tie in with the Museum of Modern Ice in February of 2008 in Chicago. Our knitting guild participated and this is one of the examples we had for people to play with. Image II: Eyelet Row Detail. 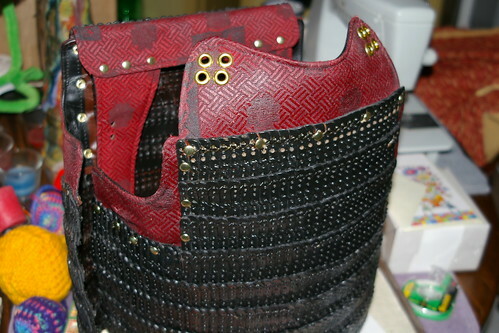 This picture is a little blurred, but I like the way the eyelets came out. They look like little arches. Image III: I-Cord: Two stitch i-cord, size 7 US (4.5mm) needles. I like how it’s coming out as a square tube, but it’s a challenge to keep the stitches straight. Image IV: The coaster itself. I like how these look; they’re very bright and festive. 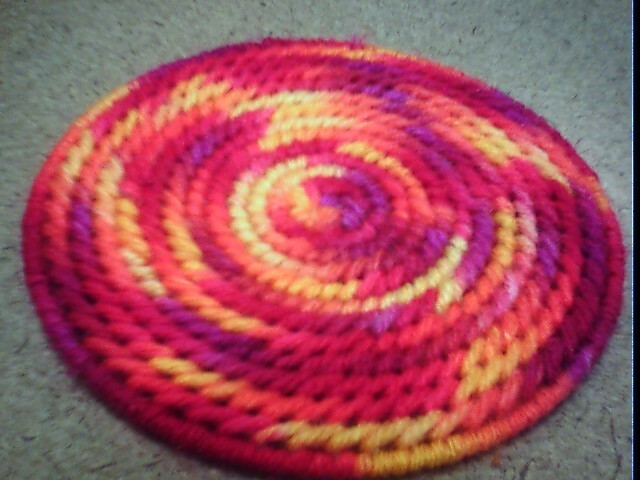 The base is a plastic disc and the yarn is the same Worsted Weight acryllic. Welcome to Knoontime Knitting, one writer’s exploration of working in three-dimensional space.